A ruthless demon overlord plots to kills two missionaries who infiltrate his realm. Only two angels stand guard. Will they be able to stop the demons before the men are killed? Will the chains of darkness be broken before all is lost? 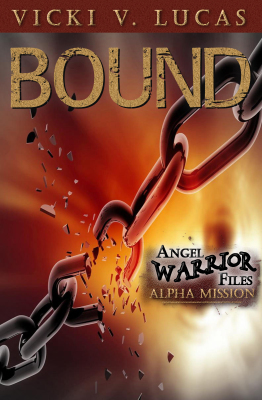 Bound, a short story of 8,800 words, is one of the many files of angel warriors who battle evil and protect God’s children. Based on a true story, Ron and Bruce had no idea they were in the middle of a spiritual battle until it surrounded them. And they had no idea of how God would use this battle to break the chains of darkness. Ron and Bruce didn’t want to stay. They had been away from their families for over a week. But they couldn’t walk away when someone was asking them to share Jesus, so they camped beneath the tall pine trees one more night. They had no idea that they would soon be in the middle of a battle with angels and demons. Bound, the first in the Angel Warrior Files, is a short story where two men wake in the middle of the night to a fierce wind above them. Meanwhile, two angels fight to protect the men from a horde of demons determine to kill them. I gave this book a five star rating. I loved how the author made it feel as if I were there watching this story happen in person. I would recommend this story to anyone, especially any missionary in the field. GREAT READ!” Joni H.
Can they fight off the demons? Will God’s love break the chains that bind the people?